Gutters serve a very important purpose on any home. They divert water away from the house where a downspout can deposit it in a safe location. Gutters do wear down over time. They can become damaged and corroded. 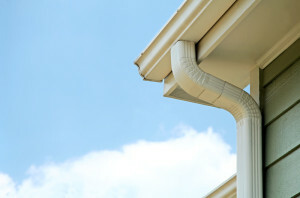 Everyone homeowner should know how to tell if a house needs new gutters. Sagging or hanging gutters are a sign that something needs to be done immediately. Aging or damaged gutters will start to pull away from the fascia on the house. The nails or brackets holding the gutters in place can fall out. The weight of the rain could then bend and break the gutters. This can create dangerous flooding. The gutters could eventually fall off completely and come crashing down unexpectedly. Gutters that have visible cracks or rust need to be replaced by professionals. Cracks can start to occur because of damage from debris or age. Rust can start to form over time especially if there are clogs or other issues. Cracks and rust both indicate that the gutters are going to fail very soon. Replacing the gutters fast will prevent potentially dangerous situations. Always look at the area under the gutters. Look for signs of water damage such as peeling paint, warped siding or orange stains. This means that the gutters are not moving the water to the downspout properly. Some of the water is pouring over the side or escaping through holes and gaps. The water damage can eventually start to wear away the structure of the house. The gutters must be replaced if there is water damage underneath. Always examine the foundation where the house meets the ground. Broken or damaged gutters will send large amounts of water to this area. Check the ground and look for pools of water, soggy soil or areas that seem excessively moist for no reason. Look for signs of mildew growth on the foundation and walls. There might even be excess moisture and mildew inside of the basement. These are clear indicators that new gutters are necessary. A final way to know that new gutters should be installed is if clogs and overflows are occurring on a regular basis. The clogs often keep appearing in the same area causing overflows every time there is a moderate amount of rain. This can be caused by gutters that were not installed correctly. It also occurs over time as the gutters shift and sag.